Let me be blunt: I never read Sherlock Holmes stories that were not written by ACD. I hate them. I also can’t stand having the character appropriated by other authors. Honestly, I don’t even care as much for the last couple of Sherlock Holmes stories written by ACD. The character feels off to me and I don’t quite enjoy them. So I immediately dismissed this book when I first came across it, but then I read a review and saw that Sherlock Holmes as he was written by ACD doesn’t appear at all, and I was intrigued. Charlotte Holmes is an odd woman. She has the characteristics of ACD’s Holmes, but as a woman is required to follow society, and so that informs her character. So she and her friend Lord Ingram come up with Sherlock Holmes, as a reclusive man who sometimes assists the police in their inquiries. Because she cannot live the life she wants, she decides to destroy her reputation. So, how did it hold together as a story? I initially had a difficult time getting into the book. I started several times, and it was only once I got past the initial scene of Charlotte’s ruin that it became interesting. Partially because the story shifts then to Olivia’s POV, and I quite like Livia. It also took awhile for the mystery to develop fully, which didn’t help, since I cared less about Charlotte’s dress and search for a job that I am sure I was supposed to. And although the female characters were fully developed, as was the Inspector (who I quite liked) I had great difficulty keeping the secondary characters apart, especially since there were a number of characters whose last names started with S and were of a similar length: Sheridan, Sackville, and Shrewsbury–I kept confusing them in my mind, which didn’t help at all. I also had difficulty believing the valet’s changing of his story. Given what Mr. Sackville was doing, I have a very hard time believing that the valet would take steps to try and stop it, but then take such steps to defend him after his death. And to be clear, the valet DID know what was going on, and was horrified by it, and tried to take steps to change or stop it. His character was simply too inconsistent for me to believe. That said, I did enjoy the story and think there is a ton of potential here for future stories and I look forward to reading the next book. 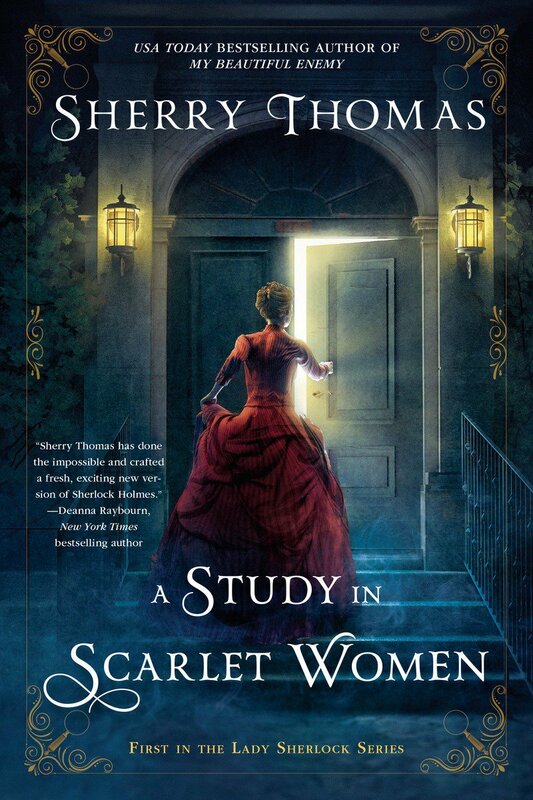 This is the second Lady Sherlock Holmes book, and as I’ve mentioned before, I generally hate Sherlock Holmes stories, but this one I don’t mind as such, since instead of taking the characters are Doyle wrote them, she has imagined that Sherlock Holmes was based upon a woman, and the stories were written by that woman’s sister. That’s fun and follows the spirit of what I like about mysteries. There is something about this story that just felt off to me. It’s possible it was the jumping back and forth in time, as the characters remember things about the past and those memories are woven into the narrative. It’s not that it’s extremely jarring, and that might not even be it, but I can’t figure out precisely what it is. The mystery is interesting, and the characters are a lot of fun, and I especially like Charlotte. Charlotte had not been to church since she ran away from home. God likely wouldn’t mind if she stepped inside His house— Jesus voluntarily associated with women of less-than-pristine repute— but His followers tended to be less magnanimous. And I like Livia perhaps even more. Livia viewed everything through a lens of complications, real and imaginary. From where to sit at a tea party, to whether she ought to say something to the hostess if her table setting was missing a fork, her lugubrious and plentiful imagination always supplied scenarios in which she committed a fatal misstep that destroyed any chance she had at a happy, secure life. For her, every choice was agony, every week seven days of quicksand and quagmire. And I love their relationship. Charlotte knew everything about Livia— and Charlotte did not want Livia to be anything other than who she was. Yet still, there was something about the story that just never gelled for me. That doesn’t mean I don’t want to read more, because I definitely do, because it was enjoyable. But I’m also glad I borrowed this book instead of paying full price for it, because it was good, but it wasn’t quite that good. The third Lady Sherlock Mystery. Society is still searching for Charlotte Holmes–and treating her sister Livia with the suspicion of one closely related to a scandal. So Livia is glad to escape to the country home of Mrs Newell–who happens to be a near neighbor of Lord Ingram. Lord Ingram has put it out that his wife has gone to the continent for her back, when in reality she has fled after being discovered as a traitor. The mystery is quite over-the-top with hidden bodies and busybodies and police with complicated married lives and missing sisters. I’m not sure how I feel about the solution to the murder mystery. It felt–perhaps beyond belief? It’s been several days and I still can’t decide quite how I feel. I also can’t decide how I feel about Charlotte. Her senses sharpened on an empty stomach, occasionally to such an extent that she needed to cover her eyes and stick her fingers in her ears. Like the Conan Doyle Sherlock, Charlotte is problematic in both her actions and way of thinking. Unlike the Doyle character, neither Holmes nor Watson holds a candle to the secondary character of Livia Holmes, who is regularly kept in the dark for her own safety, and seen even by Charlotte as being unable to be trusted with sensitive information. Lord Ingram had asked that she be put up in the manner of an esteemed guest, because she was Charlotte’s sister. This was what it felt like to be valued. It’s still sad she doesn’t believe herself to be valued for herself. It’s an interesting series, and I’m still intrigued, but I’m also glad I’m borrowing it from the library rather than pay full price for it.